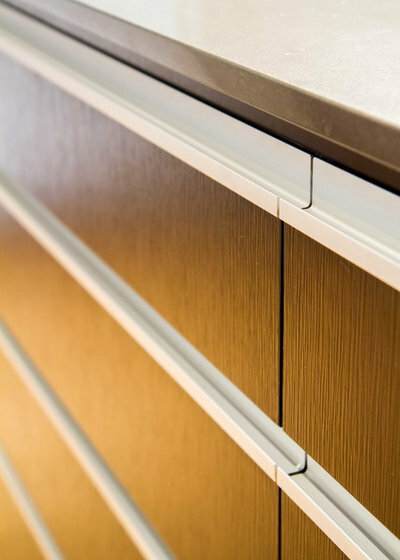 The essence of the flat-panel, or slab-door, style of cabinet is about minimal embellishment and letting the materials speak for themselves. 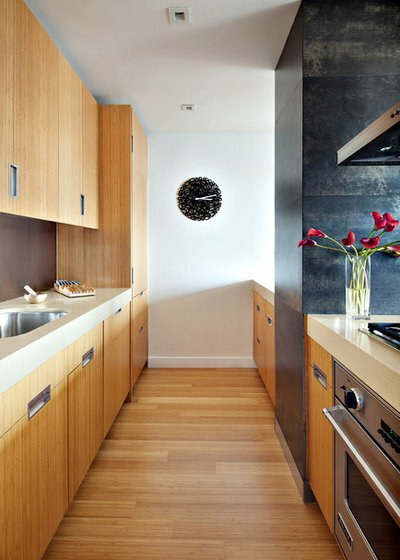 The wood grain might be the statement, or it could be a simple linear pull on a high-gloss white cabinet. Regardless of style, this look gets its strength from understatement. 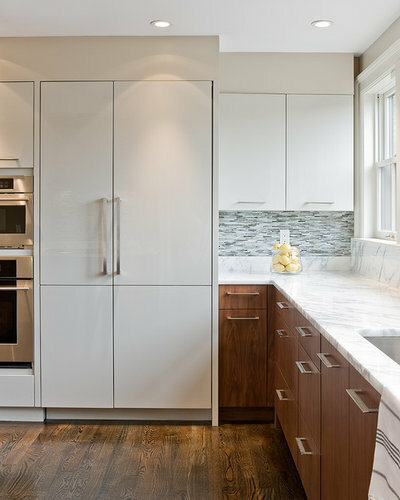 So subtle hardware choices can make a big impact in a kitchen with flat-panel cabinets. 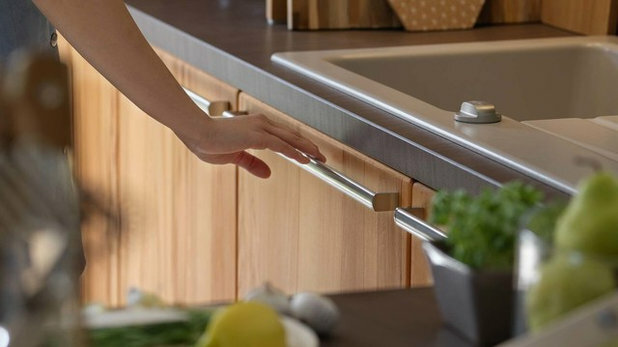 This is one of the most popular kitchen cabinet hardware styles. They most often make the biggest statement when they’re run as long as possible on the door or drawer. This style has end caps that are flush, so that you don’t have little bits that stick out and catch the pocket of your pants. Anyone who has ripped a pocket while walking briskly through a kitchen knows what I mean. 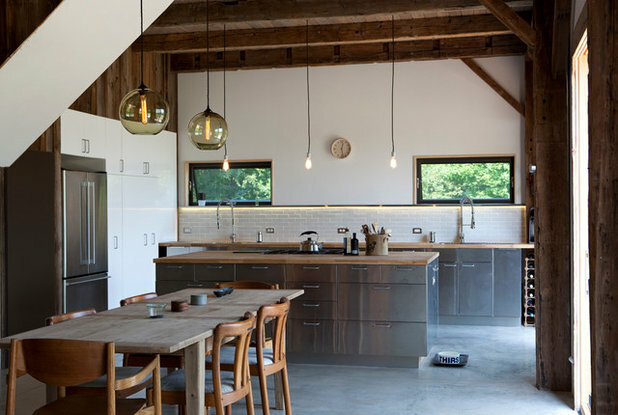 What they do for the kitchen: Add a modern, fresh and industrial appeal. These pulls have a very pragmatic feel, as though they’re designed for a science-lab cabinet. 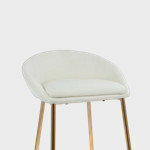 They work well with: Modern flat-panel or Shaker doors. 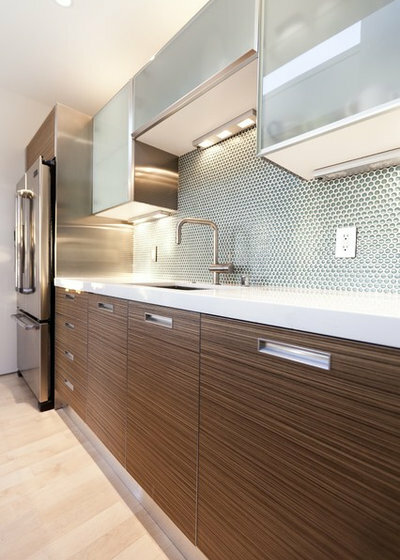 Be a purist with a sleek glass backsplash or be more eclectic and mix them with subway tile and Shaker cabinets. This is the most well-known bar pull for flat-panel cabinets. The ends stick out past where the screw holes attach to the cabinet. 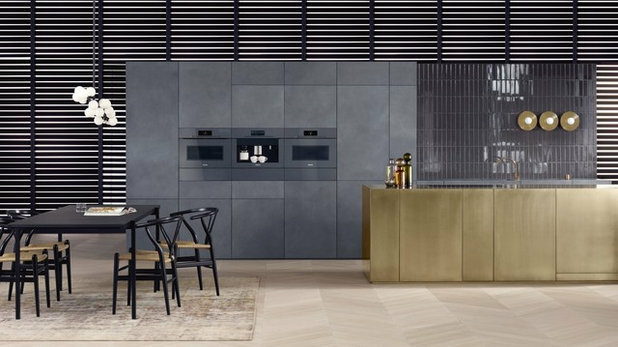 Cabinet lines from Italy and Spain kicked off this look with their super sleek modern kitchen installations more than 10 years ago, and they’re still holding their own. It’s a design that has stood the test of time. These are the pulls for modernists who prefer square edges and linear elements. It may seem like a silly distinction to some, but in modern design, these small statements make a big noise. 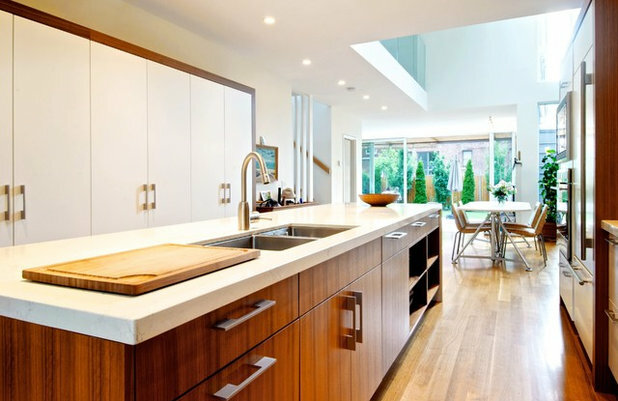 What they do for the kitchen: Add a strong linear feel that accentuates strong square and rectangular elements. They work well with: Horizontal wood grain, horizontal long drawers. 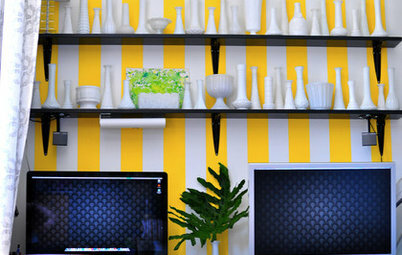 These are wonderfully functional and utilitarian – almost office-y –pulls. They’re a great choice for a high-traffic, high-use kitchen where you don’t want the pulls sticking out and getting in the way. 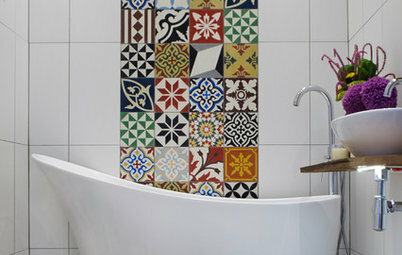 What they do for the kitchen: Give it a commercial and utilitarian feel. 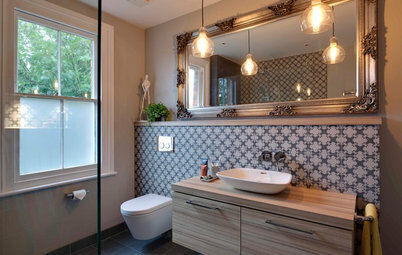 They work well with: Sliding doors, stained wood doors and metal and glass doors. These pulls offer another great option for those who don’t want their pulls to stick out into the traffic flow. They are very sleek, but be careful of dust and spills getting caught in the channels. 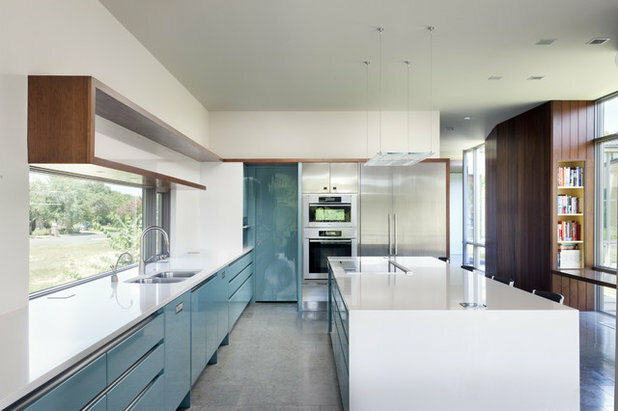 What they do for the kitchen: Accentuate linear design by running the continuous, full length of the doors and drawers. 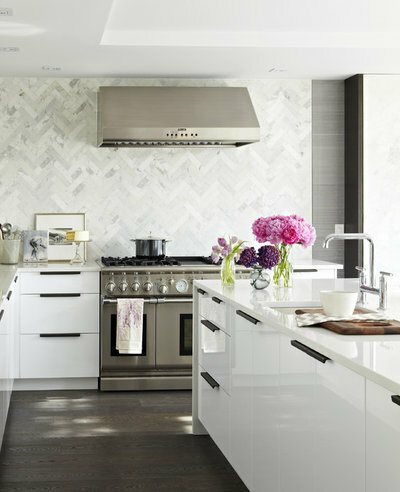 They work well with: Painted or stained wood flat-panel doors, minimalist backsplash elements and waterfall countertops. 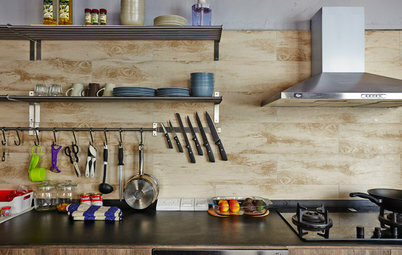 These pulls are for the purist who doesn’t want to mix too many materials in a kitchen. 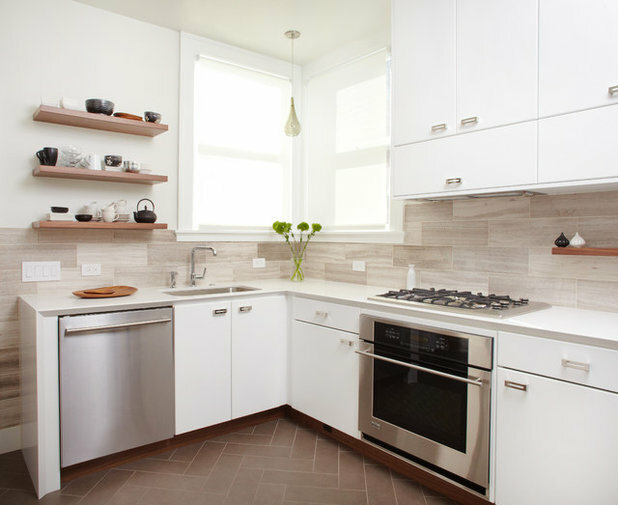 They’re not the most pragmatic choice for high-use kitchens. 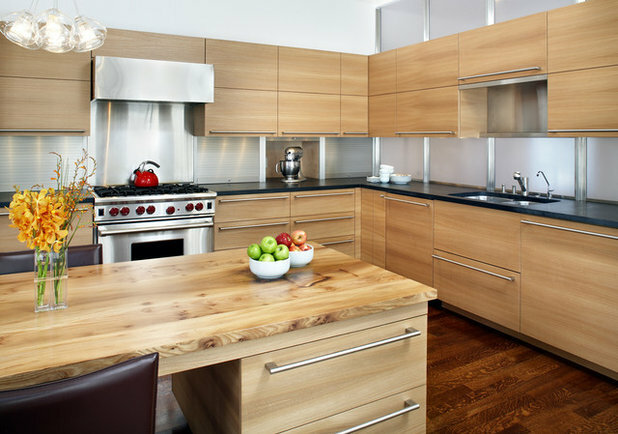 What they do for the kitchen: Create a seamless look in which metal cabinet hardware doesn’t interrupt the wood face of the doors. 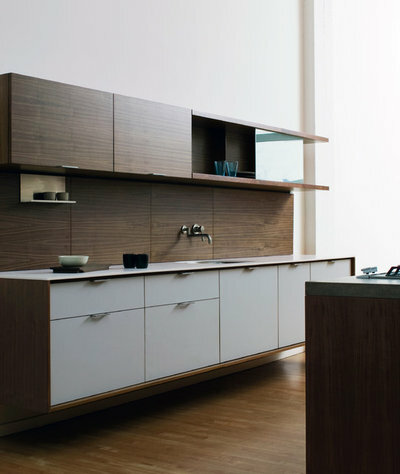 They work well with: Minimalist kitchens with no wall cabinets, kitchens with open shelves and beautiful wood veneers. These pulls are for the minimalist who wants a bit more. They’re discreet but still functional. 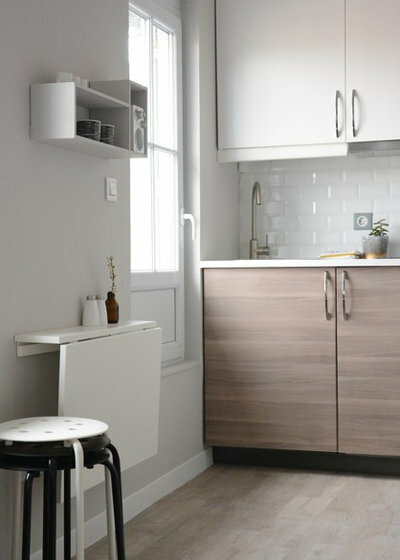 They can be done small on all cabinets or longer, running the full length of the cabinet door or drawer. 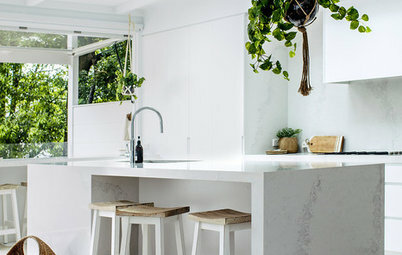 What they do for the kitchen: Add a non kitchen-y feel. 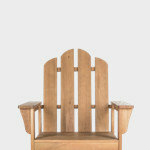 They work well with: Wood veneers and high-gloss painted finishes. 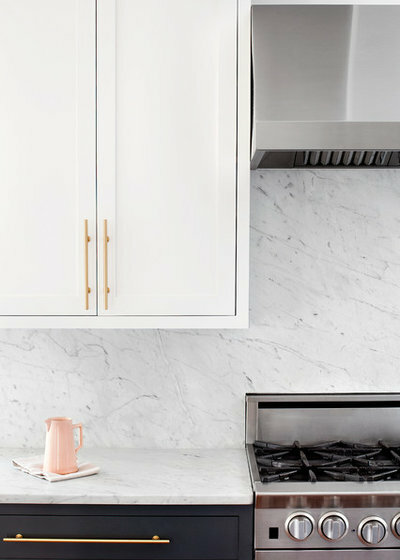 Whether they're smaller tabs in silver or longer tabs in black, their look completely changes the kitchen. 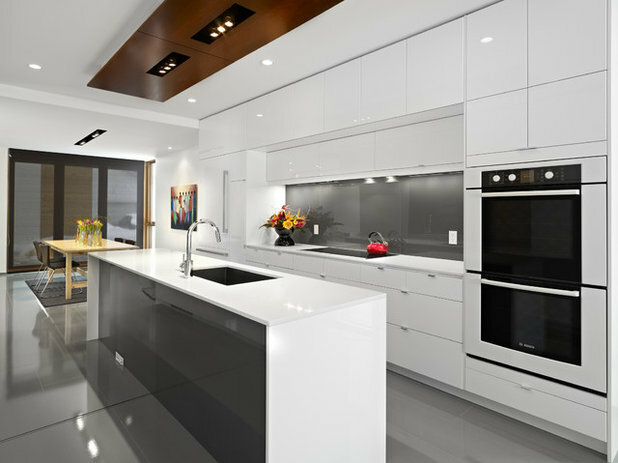 Strong black lines on the tops of all the drawers in this kitchen create a cool vintage-modern contrast. Cutout bar pulls are decorative and simple at the same time, and have almost a ‘70s feeling in antique brass. I love a pull that adds a little furniture detail and glamour to a modern flat-panel door style. 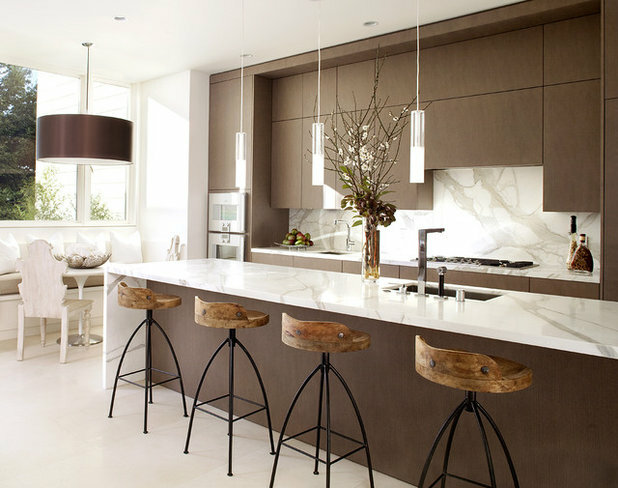 What they do for the kitchen: Add a decorative and glamorous element to an otherwise simple modern kitchen. They work well with: High-gloss finishes. 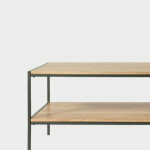 Simple, classic and utilitarian, these are great for those who don’t want their hardware to make a strong statement. 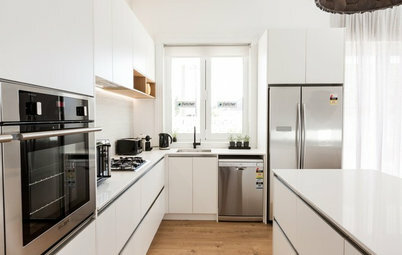 What they do for the kitchen: Keep it simple and humble. Add a bit of a commercial, no-nonsense feel. 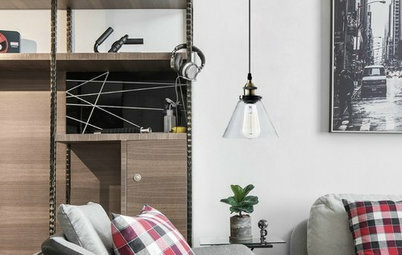 They work well with: Industrial appliances, stainless steel countertops and simple industrial lighting, like pendants with a single exposed bulb. Not for those who use their kitchens frequently for cooking items heavy on the oil or butter. Fingerprints on the fronts of your doors will drive you mad! But it’s very sleek and cool looking to not have a stick of hardware in sight. 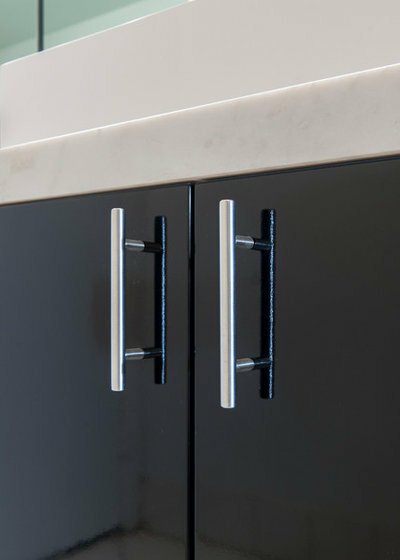 What they do for the kitchen: These latches offer the ultimate minimalist choice – no hardware statement or accessorising at all. 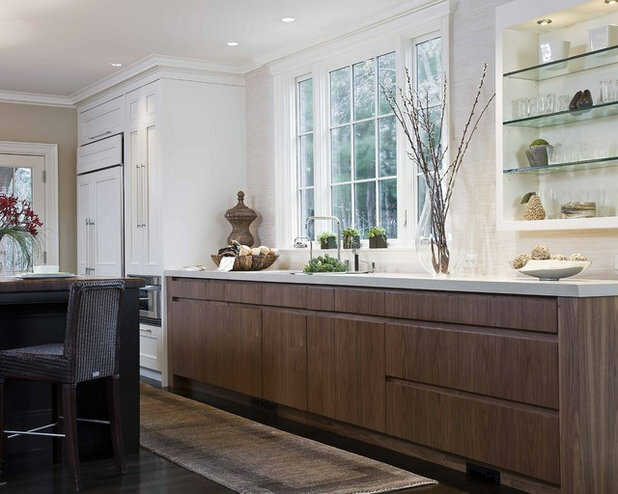 They work well with: Exotic veneer cabinets for which you don’t want anything to compete with the gorgeous wood, and full-height stone backsplashes that match the countertops for a restrained palette. What sort of kitchen hardware do you have in your kitchen? Are you thinking of switching? Share in the Comments below. 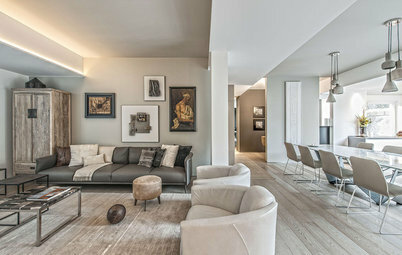 Thanks for featuring our work (LG House). 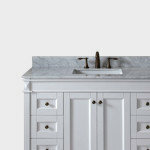 In addition to the pull tabs we incorporated the 'hidden touch latches' along the top row of upper cabinets.